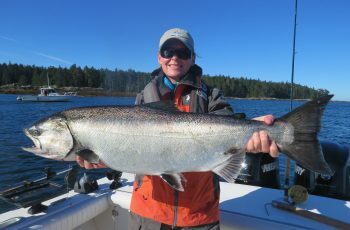 Good fishing was had by most of us here at the Clubhouse, Chinook in all locations, and a run of coho! 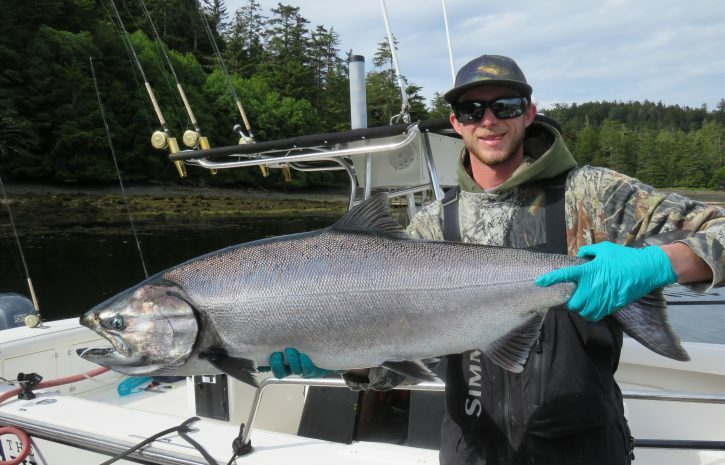 I see 7 tyees on the board, largest a 38 lber reeled in by Kyle Guilford! 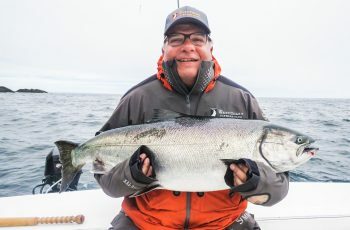 Yes, other locations have good fishing, but Langara and the top end of Graham Island stands out as the reigning hotspot for Chinook, notably large tyee. Some other great fish… Allan Lumsden angling a 36, Denis Doucet a 34, Rob Cruickshank a 33, Jake Kearsley a 32… yes tyees are being caught. 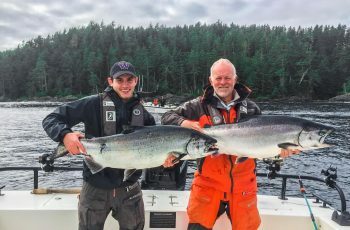 In general the fish are slightly larger than last week, now most guests releasing some fish in the twenties, with lots of springs 21 to 25 lbs. We are not seeing the Hippas as of yet, but soon I am sure. The whales and bait… herring are all up and down the east side of Langara. Bubble feeding humpbacks are very active, one barrel rolling in the air almost landing on Kauri’s humpy sled from NIL. He had a surprised look and a shaky voice on the radio, wow that was close. The water was so calm, you could make out the ring of bubbles on the surface, soon followed by a half dozen Humpbacks, crashing head first bursting in the air with mouths open. It really is an amazing site. Be careful and give them space. We jigged some herring in these massive heaps of bait and put them to use at Andrews, grabbing a 27 for Russ Samples, right on the surface while loading the release clip. 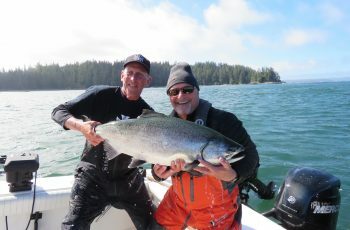 We were then invaded by coho averaging 10 lbs, sp off to Graham Island, where we hammered the tar out of mid sized Chinook. One after another, Korey, Bud and Chris on the same tack, having heaps of fun playing fish, one after another. Sure it was raining, but my guests did not blink an eye. 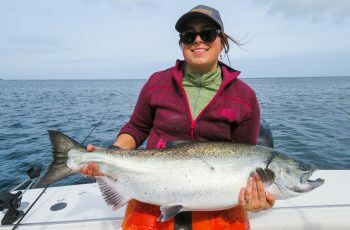 We fished shallow, 30 and 40 on the cable. How about leaving some fish for me and my partner. We are headed upon the 10th.